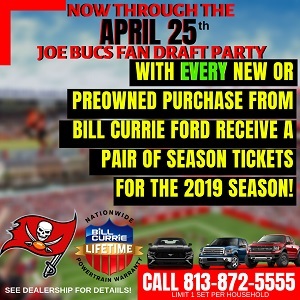 Joe has decided to document highlights of Bucs coach Bucco Bruce Arians captured when he coached Arizona during the inaugural season of “All or Nothing,” a “Hard Knocks”-like miniseries by NFL Films that follows a pro or college team throughout a season and is exclusive to Amazon. Some highlights Joe hopes will help fans learn what to expect from the 12th coach in franchise history. This series of posts will appear periodically until the days leading up to the draft later this month. It seems there is one thing, other than parking, that will send Bucs coach Bucco Bruce Arians into orbit. And that is mental mistakes. Through two games of the 2015 season, the then-Cardinals coach does not tolerate mental mistakes. In fact, watching his reaction to them, mental mistakes may have been what led Arians to the health problems that nearly chased him out of the game. Joe is looking back to give Bucs fans sort of a clue to how Arians ticks. And that ticking turned into full-blown Mike Ditka-like explosions when players make mental mistakes. Prior to the season-opener against the Saints, Arians made sure to remind his team about playing smart football. Despite a convincing win, the Cardinals had a major mental error in the first half that haunted Arians throughout the game. New Orleans had the ball inside Arizona territory when the Cardinals forced a punt on fourth-and-three. But the Cardinals were whistled for too many men on the field giving New Orleans a first down that later resulted in a touchdown. Arians went bonkers and NFL Films cameras caught him throughout the game moaning about that play. When players came off the field after a series in the second half, Arians kept reminding players individually about that braindead penalty in the first half. It was as if Arians wanted each of his players to feel his pain. The following week the Cardinals played at Chicago. There, a mental lapse by his quarterback, Carson Palmer, nearly sent Arians into a cardiac arrest. The Cardinals were nursing a four-point lead with just over a minute to go in the first half. The Bears had just kicked a field goal to pull within 28-24 when NFL Films cameras caught Arians telling Palmer if a certain play wasn’t there, to throw it away. Palmer didn’t listen and instead tried to complete a short pass to the left that was picked at the Arizona-14. Arians calmed down enough to talk to Palmer in a reasoned manner and hugged Palmer and patted him on the helmet and actually consoled his veteran quarterback, but at first, it sure seemed as if Arians needed the consoling. His initial reaction to the interception seemed like Cardinals team officials were going to have to pull a cardiologist out of a Soldier Field luxury box. Arians’ blood pressure must have spiked to about 800. Later in the episode, Cardinals star receiver Larry Fitzgerald said passion from his coach is understood by players because they all know Arians strives so hard to help players improve. A later scene shows Arians at a practice in a lead up to a game against the 49ers. Arians isn’t happy with the sloppy practice and lack of attention to detail and, in particular, mental errors had him dropping F-bombs right and left. If sure smells like Bucs players better quickly get used to using their heads. A simple mental screw up and Arians will turn their ears purple and rear ends bright red. Don’t let Jameis read this Joe, he might get really scared. I bet Bruce just loves unforced fumbles and bad decisions by his QB. It should be a very telling and entertaining season though. LOL, exactly. If you look up Mental Errors in the dictionary, The Bucs’ Team picture is there. defense rules says….. PERFECT COMMENT 🤣🤣🤣 we will start losing more of the bad seeds soon enough! $5 says BA won’t last the 2nd quarter of the opener. Does he know what he is walking into with our QB situation ? We will need a team doctor for the players and one for the head coach. This is exactly what the Buccos need to hear and not be mollycoddled. Men earn respect through accountability and hard work , BA will make sure of it. There will be growing pains , but at the end of the season , the result will be more wins. Jameis Winston might be tried for manslaughter after this year. This is exactly what we need…….Schiano toughness but with the Arians follow-up. My first thought is Jameis is going to send this poor guy straight to the Morgue! Health issues and a QB who makes mind blowinly stupid plays is not a good combo! Hope for his sake he can clean Jameis up! Maybe the word soft to describe this team is over used…….NOPE describes the last 10 years perfectly! I wonder how long it will take for the sheep to pick up on the players grumbling and start saying that the coach is “mean” and a “control freak” like they did the last time!!!!!!!!!!!!!!!!!!!!!!!!!!! 2019 will reveal answers to the sheep, that the “real” fans already know!!!!!!!!!!! That Carson Palmer story has Jameis written all over it. If the play isnt there, throw it away. Good luck taming that bull, BA. “Does he know what he is walking into with our QB situation ? I was curious to see if this statement was true or not, so I actually did some research. It’s a little difficult because I could not quickly find total turnovers rankings for QBs…but I could find Interceptions and Lost Fumbles. Winston entered the league in 2015, so we have 4 years to look at up to this point. Interceptions – Tied at 5th. Ben Roethlisberger, Sam Darnold, Case Keenum and Drew Luck all had more picks. Fumbles Lost – Tied at 13th. Some pretty good QBs had more…including Matt Ryan, Matt Stafford and Carson Wentz. Interceptions – Tied at 16th (11). DeShone Kizer led the league (22). Of note, Cam Newton and Matt Ryan both had more picks. Ben Roethlisberger was ranked 4th. Fumbles Lost – Tied at 1st(7). Of note, DeShone Kizer had 6 Fumbles Lost, giving him the most Total Turnovers (28). (Winston had 18 Total Turnovers). Interceptions – 2nd (18). Philip Rivers led the League (21). Fumbles Lost – Tied at 1st with Blake Bortles (6). Of note, Philip (5) had the most Total Turnovers (26) as opposed to Winston (24). Interceptions – Tied at 5th (15). Blake Bortles led the league (18). Of note, Peyton Manning, Ben Roethlisberger, and Matt Ryan all had more picks. Fumbles Lost – Tied at 30th (2). Cam Newton, Marcus Mariota and Josh McCown all tied for the lead (6). Not only has Jameis Winston NOT led the league in turnovers since being drafted…but he has not even led the league in one of his individual years. So that makes your statement a complete lie. But they will still be in denial…so don’t expect to feel good about it. Speaking for myself, I’m still waiting for Bruce Arians to impress me. So far, he;s only made the team worse…and that statement is factual. Are you buying that stopping Santos from kicking off will help improve his FGs and Point Afters? Yet another example of BA making the team worse. Some might wonder how the kicking game became worse when its the same kicker? The reason is because Santos didn’t play a full season last year, so he had fewer chances to miss. This year he’ll be able to miss more…unless we replace him during the season. I wish they’d just bring in Matt Bryant and be done with the kicking issue for a year or two. That would be a HASSLE. Bonzai, thank you for that info and setting the record straight. Many of the idiots on here just like to throw crap against the wall and assume it sticks because it meets their trolling agenda. I am not buying the hype don’t get me wrong I love BA but he’s got a big mouth which only makes him look good when winning. He’s already killed hopes of trading Geraldine and I’m not sure what tape he watched that caused him to bring back the entire o line and not make a move on a free agent running back but he’ll be a genius or seen as a loud mouth here. I respect Bonzai he’s been on here for years and has some great takes. Calling people idiots takes away from any credibility you might have. ALSO QB Rating average 88.5 over 4 years makes him close to last. I want Winston to do great the rest of his career but until that happens numbers are what they are. It’s been said on people calling the games forever . Him and Blake bortles were one and two. Bottles with more interceptions and Jameis with fumbles. If you combine both it’s Jameis. Where universe do you live in. It’s not something made up. It’s public common knowledge. That’s been quoted on this site a 1,000 times. It’s not a lie. It’s a fact. Dude. Crawl back in your weird hole. im confident we’ll do better….with that said, im in wait and see mode…..
Just google it next time. No words are coming from your mouth, Bird.